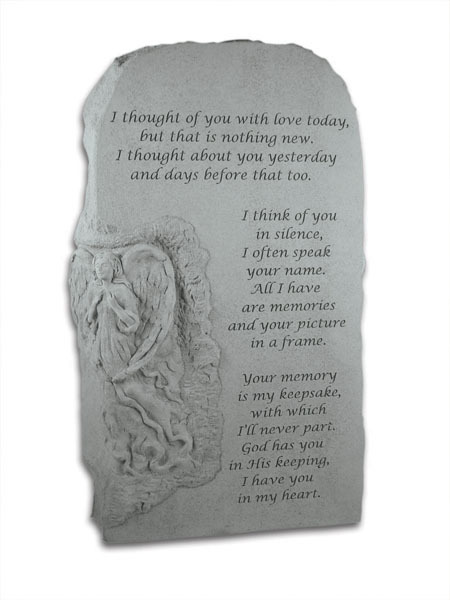 The angel memorial stone totem, I Thought Of You With Love, is etched with a heartfelt message in remembrance of a loved one. Made in the USA by talented craftsmen, the garden totem is constructed of cast stone concrete. The durability of the stone provides for a lifetime of beauty. I often speak your name. Angel totem measures 13.5" x 23" x 5"
Ships directly from the manufacturer. Please allow 2-4 business days to process the order before shipping.